Aviation service from the Met Office. Requires registration. This is the first port of call for anyone interested in Hot Air Ballooning, whether as an existing pilot, an aspiring pilot, or someone with a general interest in ballooning as spectator or crew; Hot Air Balloon maintenance and technical matters. Although ballooning in the UK has one of the best safety records in the world and is one of the safest forms of aviation; it is prudent to always check you are using a properly licensed operator when you purchase a balloon flight. All BABO members are current holders of an Air Operators Certificate and have signed up to a Code of Conduct to ensure the very highest of standard are met. As a result, all BABO members will strive to provide excellent customer service and care, and use national terms and conditions of sale which are registered with the Office of Fair Trading. 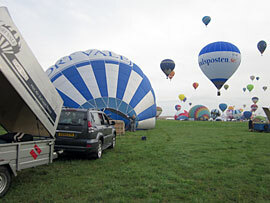 A listing of worldwide hot air balloon events, from club grass root events, to the big festivals. The Civil Aviation Authority is the UK's specialist aviation regulator. A page of animated instructions on how to tie common knots. Linley Hill Airfield, Linley Hill Road, Leven, Beverley, East Yorkshire. Pennine Region hosts for the annual Humber Bridge meet in November. Very friendly club with great club house, and opportunities to learn to fly in a variety of aircraft. The designers of this web site.